The marketing technology (martech) industry has seen $44B in total all time funding. 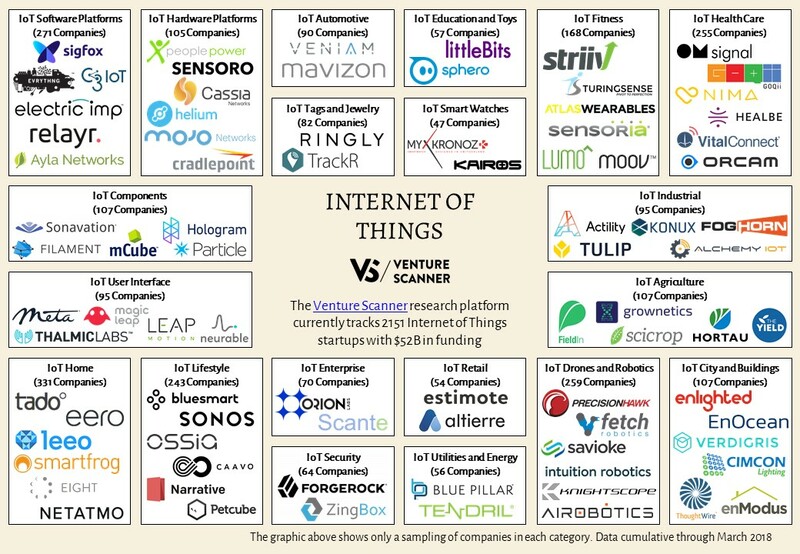 Let’s examine the investors financing the martech sector and identify the most active firms. 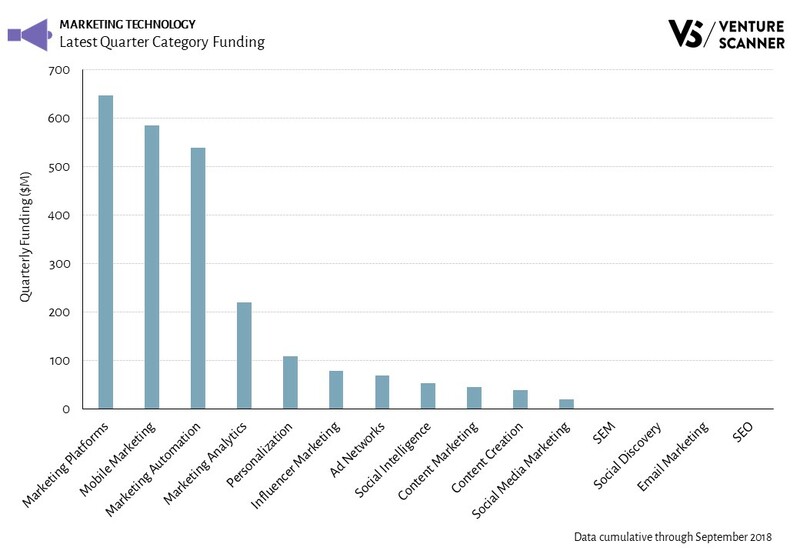 In summary, the Marketing Platforms category is the clear funding leader both in Q3 and all-time. 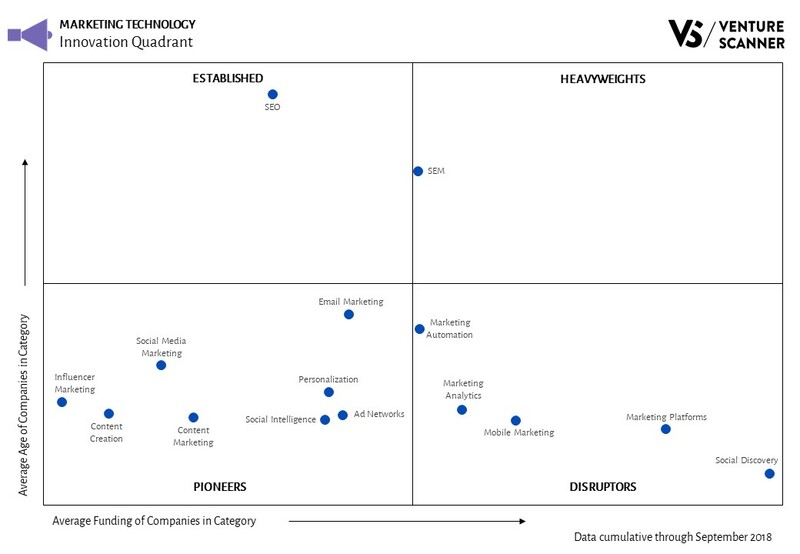 Let’s see how the the rest of 2018 shapes up for marketing technology! 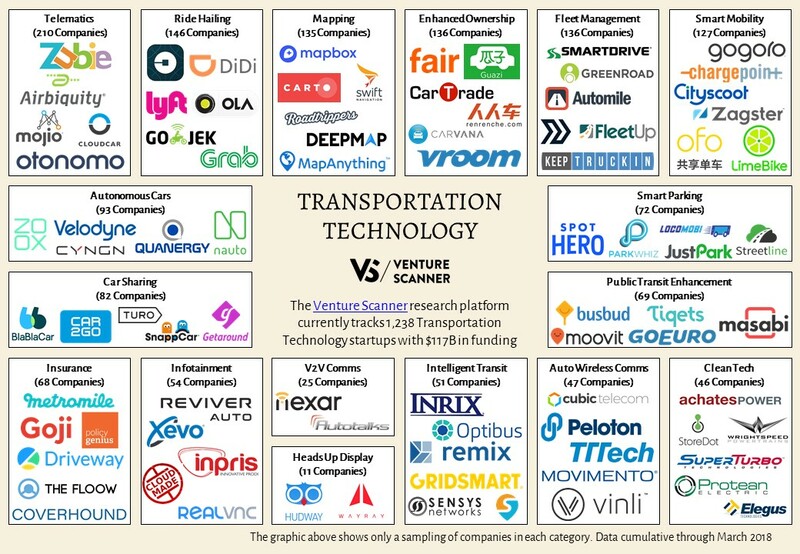 To learn more about our complete marketing technology report and research platform, visit us at www.venturescanner.com or contact us at info@venturescanner.com. 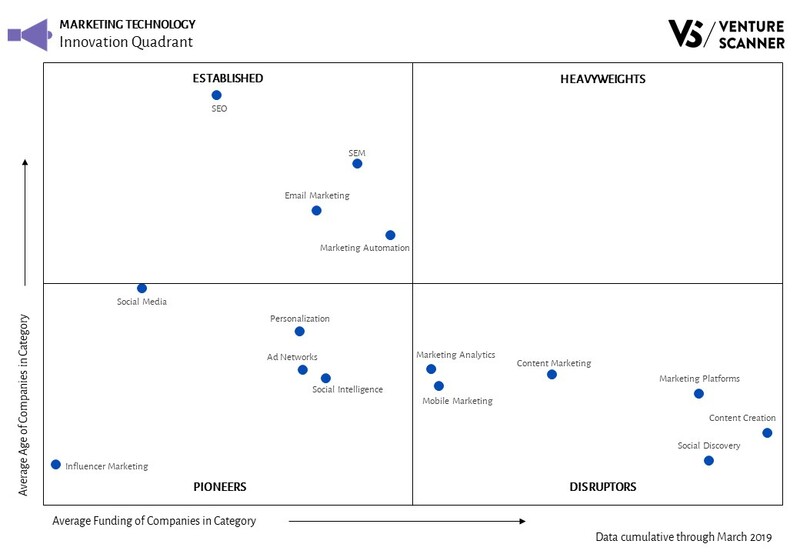 We’ve analyzed the martech categories and their relative stages of innovation. 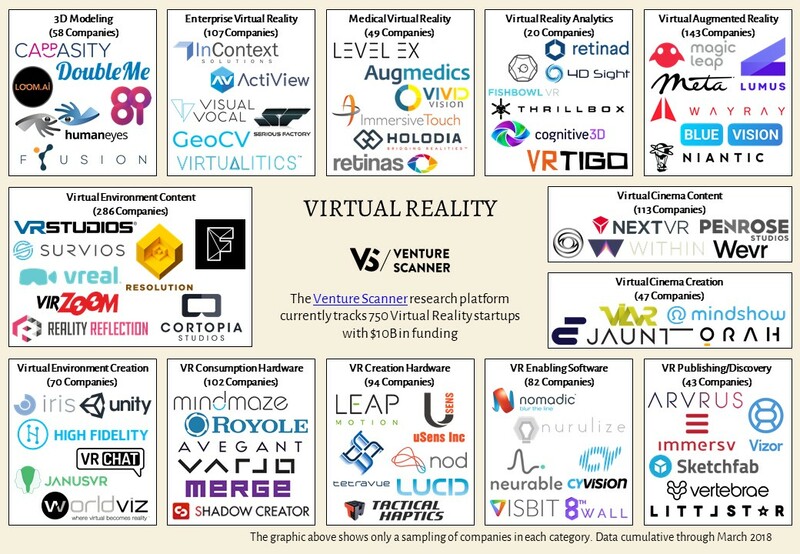 Let’s now look at how they stack up against one another in terms of their total funding versus company counts. The analysis above demonstrates Marketing Automation Software leads the sector in total companies. 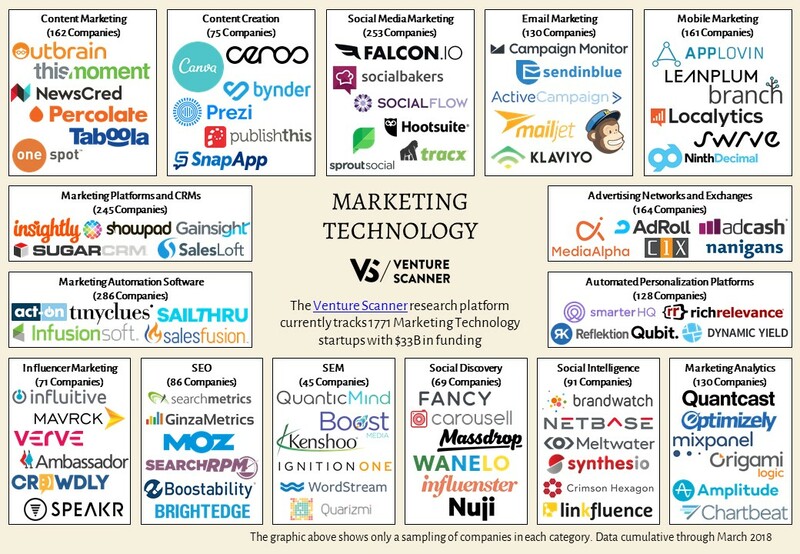 The Marketing Platforms category leads in total funding. We’ll see how things evolve during the rest of 2018. 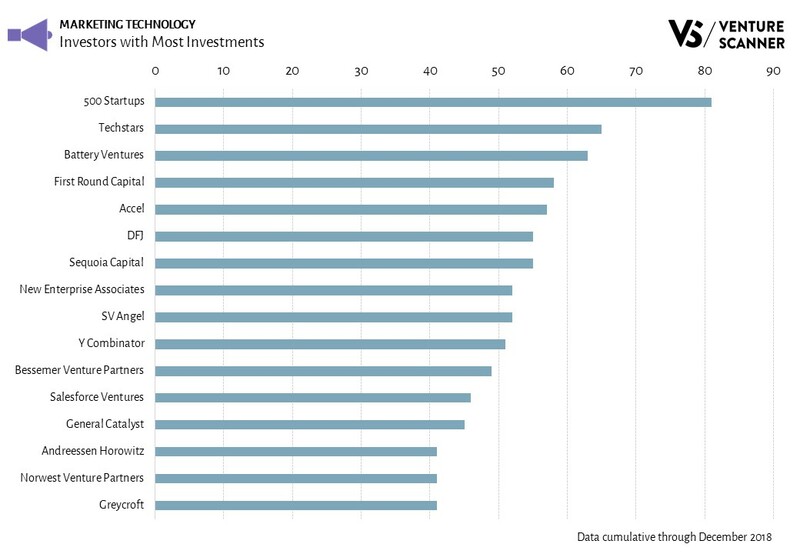 This graph illustrates that martech funding is on a stable upward trend at the annual level. Specifically, the CAGR in funding amounts from 2012 to 2017 is 19%. 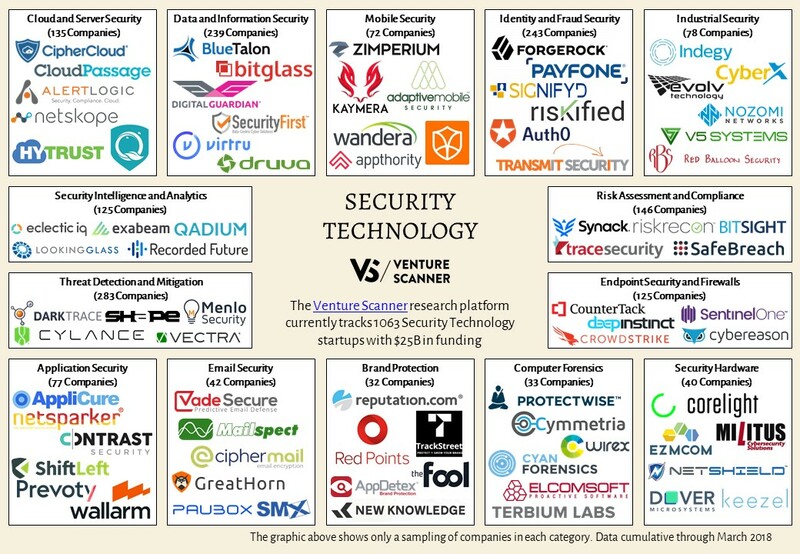 We have seen that martech funding is steadily growing, but what about the total number of deals? 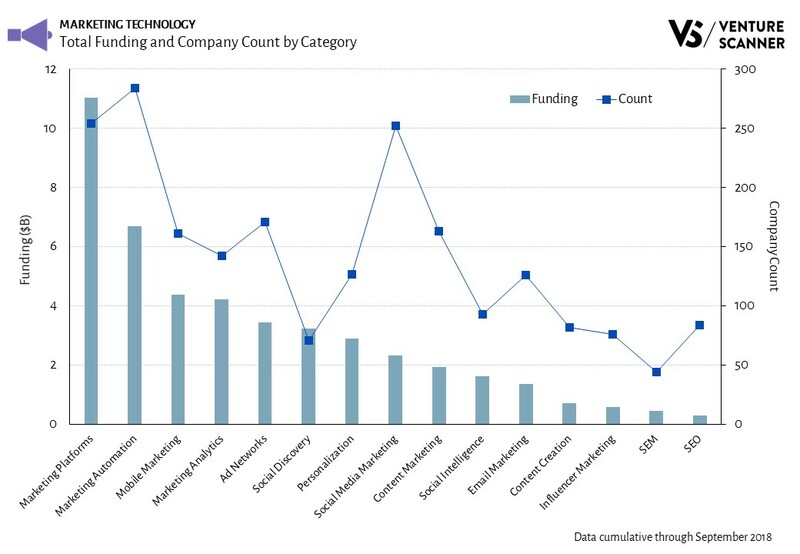 The following graph shows us the annual number of martech startup funding deals, stacked by quarters. The above graphic illustrates that the number of martech funding events saw a healthy upward trend from 2011 to 2014 and declined thereafter. In fact, the CAGR in funding events from 2012 to 2017 is -5%, and the number of events in 2017 is 88% of that in 2016. 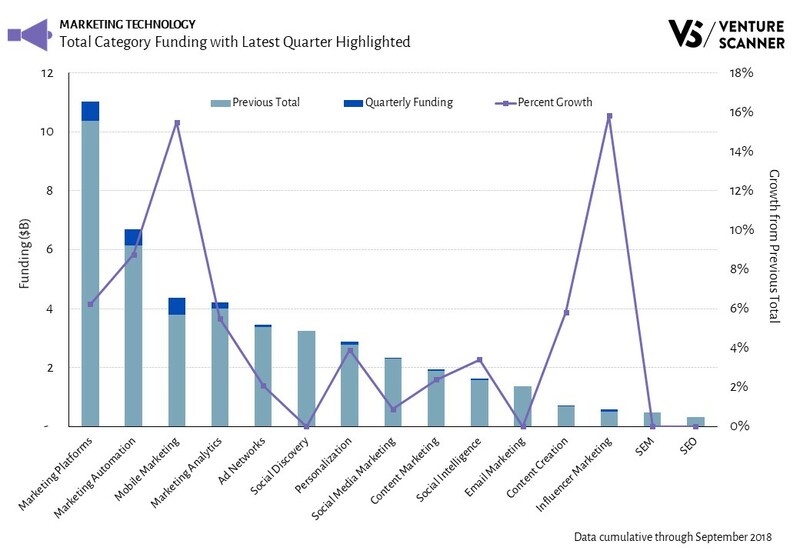 We have seen that martech funding amounts are increasing steadily but its funding events are seeing a decline. 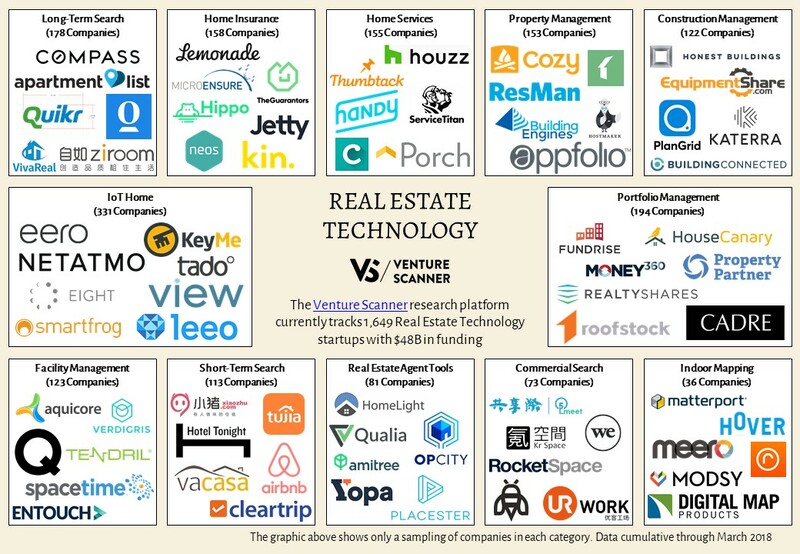 Let’s see if the trend in average deal size sheds any further insight. 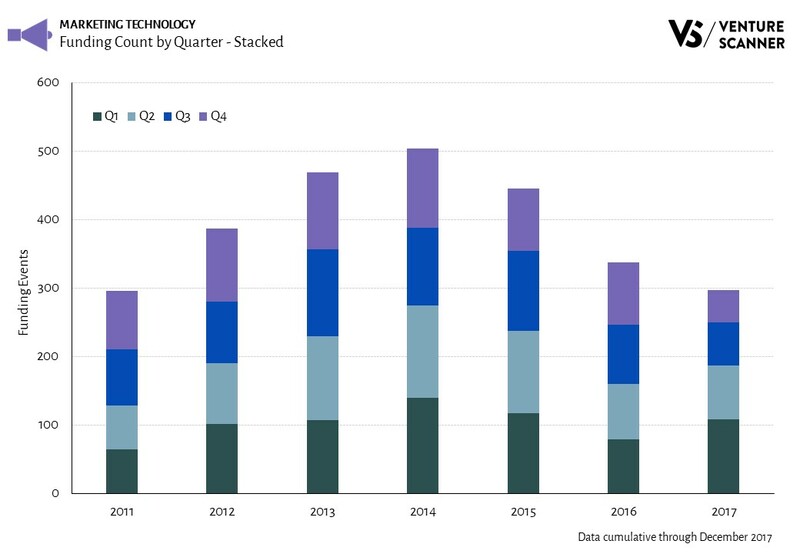 The following graph shows the average funding deal size in Marketing Technology over different quarters from 2011 to 2017, as well as the trendline. 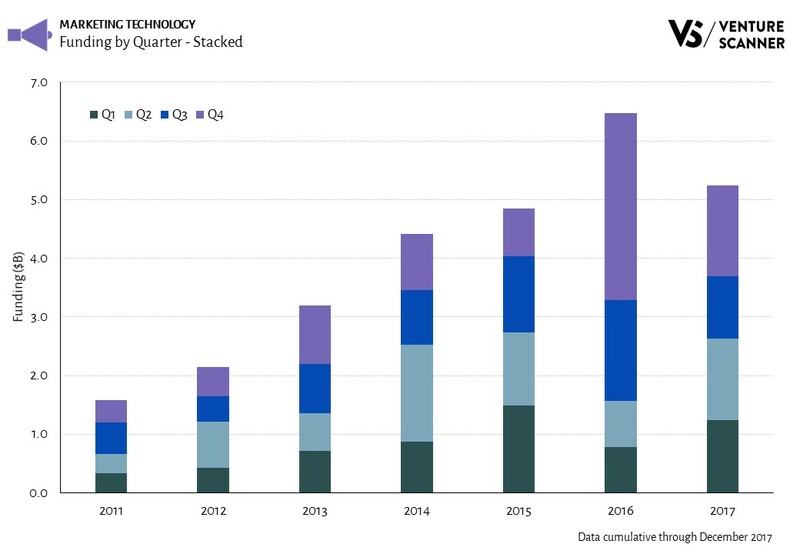 This graphic does indicate that the average martech funding deal size has experienced steady growth over the past few years. The trendline shows that from Q3 2011 to Q4 2017 the average deal size has grown by approximately 500%. This stable upward trend in average deal size demonstrates that the investments in Marketing Technology have indeed become weightier over time. 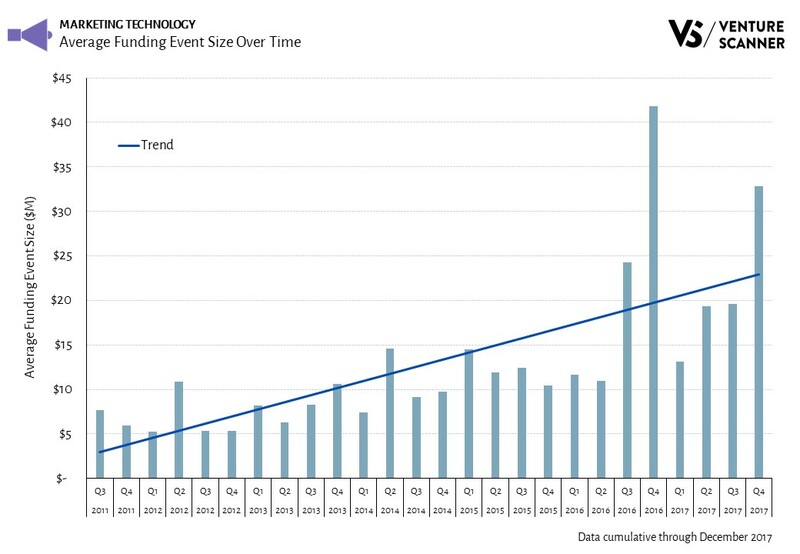 In summary, we have seen from the above graphics that martech funding amounts are on a general upward trend at the annual level, yet its event counts have seen a decline in recent years. Moreover, the average funding deal size has been growing consistently over time. 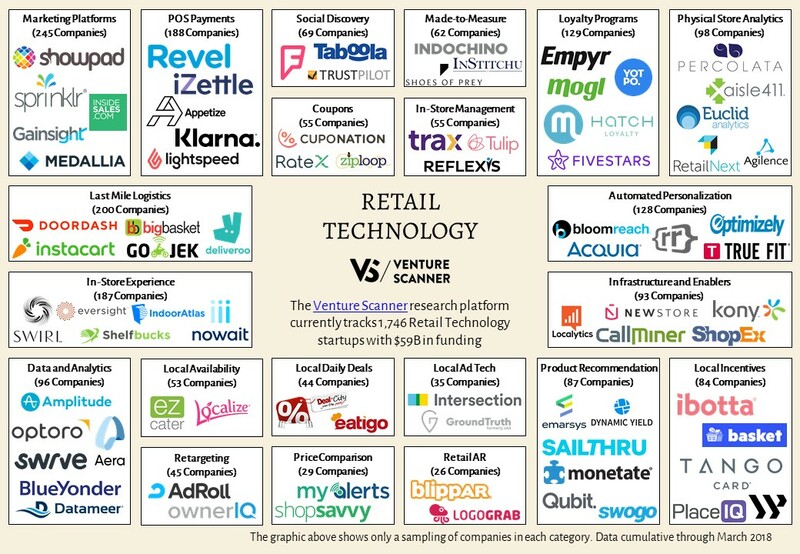 These takeaways lead us to conclude that the investment rounds in martech have become more substantial–in that the bets have become fewer but larger over time. It’ll be interesting to see if this trend continues in 2018. 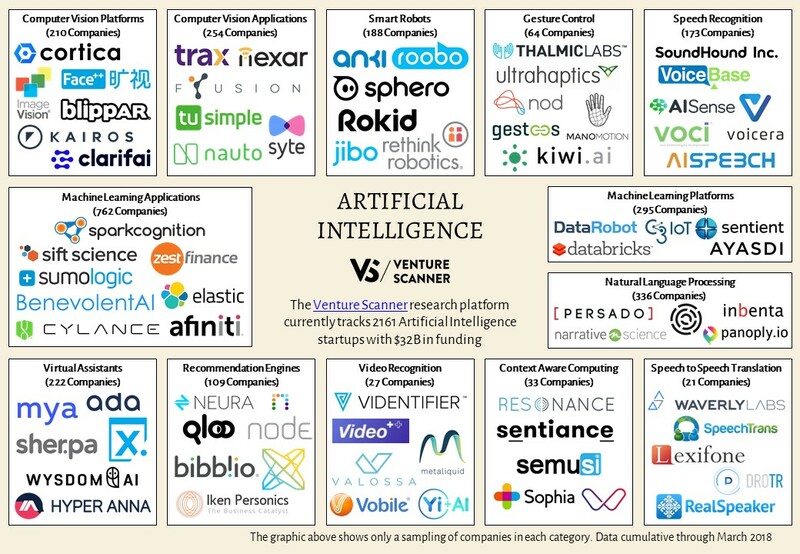 To learn more about our complete Marketing Technology research platform, visit us at www.venturescanner.com or contact us at info@venturescanner.com.